When I used to drink a lot of beer, I earned the nickname "walnut" for my supposedly minuscule bladder. But people who know me know that my small bladder isn't only active when I'm at a bar; it's active all the time. I don't know what the deal is, but I'm a frequent visitor to the bathroom. I attribute it to my impeccable health, seeing that my body quickly and efficiently processes liquids and gets rid of them. Hey, whatever. I've noticed several gas stations pop up in my area lately, and I don't quite understand what's going on. I've seen little places like Delta and A-1 in the past, and I can conclude by their low prices, lack of pay-at-the-pump, and poor physical layout that they're locally owned and operated and have nothing to do with any of the major oil companies. But just recently, two separate companies have done things a little differently. A place called "Snono" took over a station that was previously run by Mobil. It kept all the same colors and basically looks like somebody made a misprint ("Snono" doesn't exactly feel like a familiar word). Other than that, it looks like a legitimate gas station, and it would make sense if it had ties to a larger company like ExxonMobil. In another area, a station called "Woroco" appeared where a gas station had been previously but had shut down* several months ago. It seems Woroco is a NJ-area oil company with colors strikingly similar to Texaco's, but as far as I can tell, there's no affiliation. I just think it's weird that an unknown company can come into an area, build a huge gas station or take over an existing one, and sell gas without going through one of the big guys. Similar to world fatness, here are some rankings for world innovation based on number of patents, technical skills of a country's workforce, and the quality of its telecommunications and information technology infrastructure. 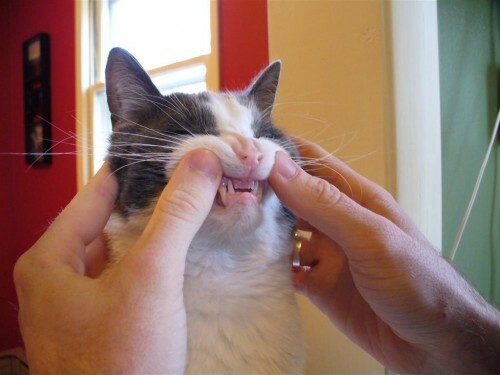 Have you ever lifted up your cat's lips to check out their teeth? What we do to our animals, we also do to our kids. This is my nephew Nathan. 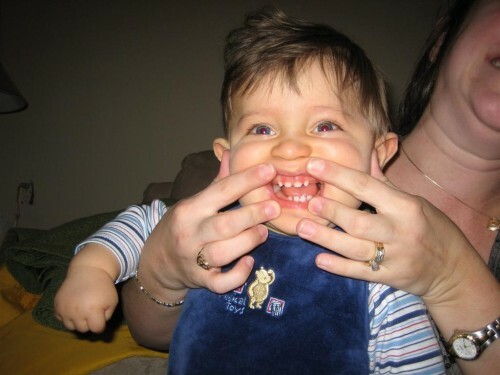 His mom had the same fascination with his teeth. For some reason, tires on the cars I drive don't do too well. I hit curbs. I generate 60,000 miles of wear in 10,000 miles. And apparently, I do something to cause slow leaks. I'm not sure what the problem is, but I keep getting a slow leak in my right rear tire. My current tires aren't worn enough to warrant the phenomenally large purchase of new ones. And I can't get a single new one because it'll cause uneven wear.